The project of setting up a permanent representation of Normandy in Jersey was fully supported by the Island’s authorities and approved by the French Minister of foreign affairs Alain JUPPE, in 1995. The opening of this new link between Normandy and the Channel Islands has been wanted after the closing of the Consulate of France in Jersey in 1993. Nowadays, Maison de la Normandie hosts the French Consular agency in its building. This is how the Maison de la Normandie et de la Manche was created. It was decided that the bureau would be composed of elected representatives from both the Conseil Départemental de la Manche (County Council of La Manche) and the Conseil Régional de Normandie (Regional Council of Normandy) who both equally fund the activities of the office. Besides Maison de Normandie, the Bureau de Jersey in Caen was created in 1998 under the initiative of the Government of Jersey. 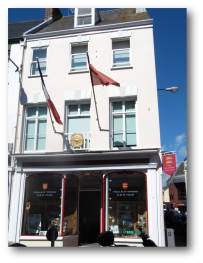 The bureau is now called Bureau des Iles Anglo-Normandes (BIAN) since 2014 as it now represents the Channel Islands as a whole in France.